Due to circumstances beyond our control, we may find it necessary to cease operation of the GreatGold Classic Hit Oldies internet radio station stream in the future, unless we get financial help from listeners like you. In order to continue operation, we must continue making payments to the creators of the music we play, required to legally operate. The royalty fees we pay are the largest part of our operating expense. If you like our Classic Hits music mix, please help us pay the fees so we can continue to play the music for your enjoyment. We have been a legal internet radio station since the beginning of our first day, because we believe the creators of the wonderful classic hits from the 1950s through the 2000s deserve to be compensated for the results of their work. In doing so, we have been paying the songwriters and musicians monthly for the songs and recordings we have been playing 365 days and nights, 52 weeks out of each of the nearly 10 years. We find we can no longer continue to do so strictly out of our own pockets. We have been operating this station on a retired person’s income as the hobby of a former, professional, over-the-air radio personality and news person. That limited retirement income has not increased substantially since we began, but, the expenses have gotten greater and greater every year. So, even though the music lover who started this internet radio station would dearly love to continue, finances do not allow that to happen, unless you and other music lovers help out by doing your part and Help Keep The Music Playing. Due to the fact that we prefer to stream the audio to your device, legally, we cannot play the music for you to hear, unless we pay the copyright and performance fees for internet play of the songs. So, we sure would appreciate your efforts to help us through the BE A BOOSTER fund raising promotion at http://greatgold.fm/booster. Help out by giving $10, $20, $30, $40, $50, $75, $100, $125, $150, $200, $250 or $300. Unless we gain revenue through your giving, we may not be able to pay the music copyright and performance fees, which accumulate every time, every listener, hears each, individual song we play. Every time we play it. You can do your part by being A GreatGold Booster through reimbursing us for a small part of the costs. The giving process is a simple, easy, painful way to participate in our effort to Keep The Music Playing. Go Here now to see how easy it is. We don’t want to stop playing these great Classic Hits from the 1950s thru the 2000s for your enjoyment, but, as a result of our legal and moral conscience, we must stop, unless we have funds to pay the music creators and performers for the product we all, so much, love to hear. 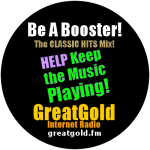 When you become a GreatGold Booster, you help us continue the tradition of playing The Greatest Songs by The Greatest Songwriters, Singers and Musicians from The Golden Years of Popular and Rock and Roll. 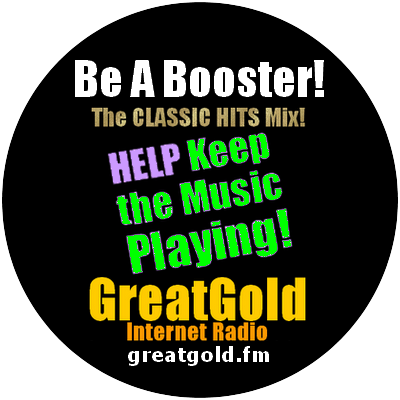 If you would like to hear us continue in the future, please become a GreatGold Booster now, if you have not done so. It’s easy. Just make a donation, small, medium sized, or large, at Our GreatGold Booster Page to help with expenses.